My kids love to play with water beads! They really are one of the most fun sensory play activities! But if you have never heard about water beads or are new to using them for sensory play with your kids, you may be full of questions. How do you use water beads? How do you store water beads when not in use? What do you do with them once you are done? 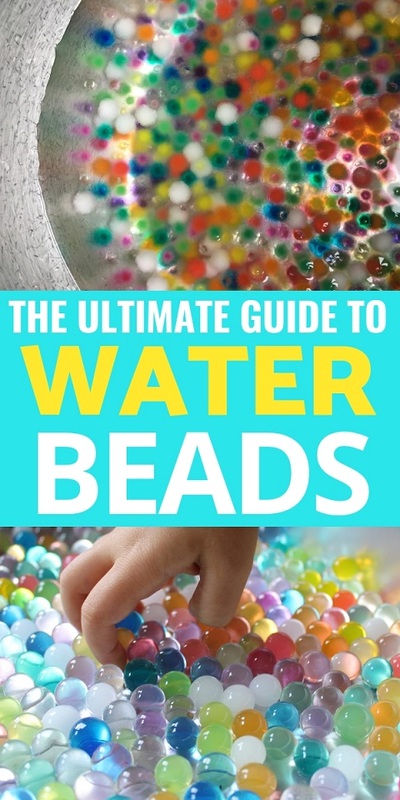 Where do you get water beads? So let’s take a look at the answers to this question in this guide to using water beads for play! The original purpose of water beads was for florists to use in arrangements. They hold a ton of water and keep flowers and plants hydrated- and look amazing in vases! But eventually teachers and parents caught on that they could be used for educational and sensory education as well. 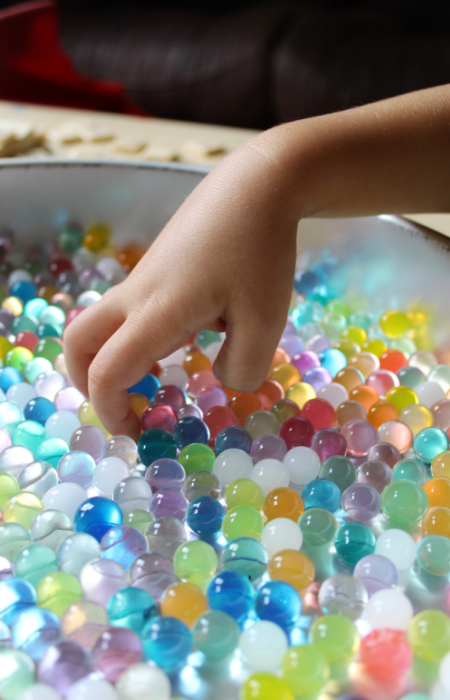 The first time we used water beads they were actually called “gel marbles” because that is just what they look like! The look just like marbles! They are non-toxic, but be careful and keep an eye on young toddlers, especially those who like to put things in their mouths still since water beads can be a choking hazard. 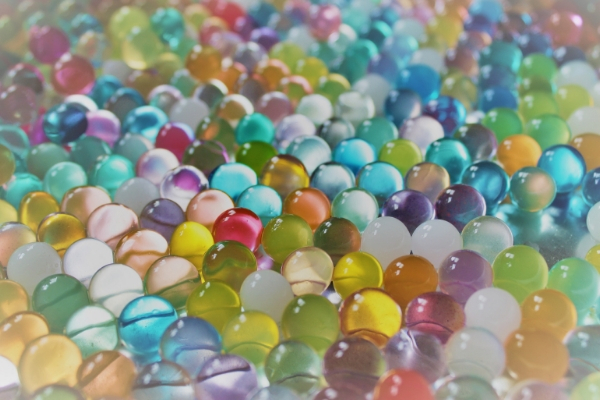 Water beads come in a dehydrated state. They look like very tint balls- not much bigger than the head of a pin. To grow them, simply place your water beads in a bowl and add water. Then allow them to sit for a few hours as they absorb the water around them and grow. You may have to add water as they soak. Once they are smooth and about the size of a standard marble they are ready to use! Water beads have so many fun uses! And are great for teaching all sorts of skills and concepts. They can be used purely for sensory play by filling a sensory bin with them and adding scoops and bowls. You can also add water beads to other sensory objects such as slime or shaving cream. If you have very little ones consider making a water bean sensory bottle or sensory bag. Water beads are also great for building small muscles and fine motor skills. We love to use them to pour and transfer. You can check out my post on 8 Ways to Use Water Beads for Sensory Play for some inspiration! You can also use water beads as a base for educational activities such as sorting and learning color or learning to count for preschoolers. For older kids you can use them to create hypotheses and experiment. If you place a clear water bead in water will it change color? If you hydrate a water bead in a confined space will it change shape? If you continue to soak water beads will they continue to grow? They are slippery and bouncy and have a lot of surface tension that makes activities that test this tension a lot of fun. Try out hammering them or squishing them to see how much pressure you need to break that surface tension. Really- the options for water bead play is limitless! Just use your imagination! In their dehydrated state water beads are stored in any container- Ziploc bag, jar, or tupperware. Theoretically, you can rehydrate and dehydrate the beads again and again, but I find that they mold to quickly to dry and store. We treat our water beads as consumables. We soak them and play with them for a few days and when we are ready to move on to a new sensory activity (or if we notice signs of molding) we toss them. You can place them in a closed container or bag to store for a few days, but I tend to leave them in a open bin while we have them out. What do you do with them once you are through? Like I said, the shelf life of hydrated water beads is short.You can try to dehydrate them again by laying them in a single layer, just watch out for signs of molding. What do you do with them when they are starting to mold or are past their prime? We like to save the “smashing” activities such as hammer water beads for last and then you can simply toss them outside. Or even add them to potting plants. Water beads are environmentally safe and are the same thing used in some potting mixes or flour arrangements to increase the water retention. They can also be safely tossed into your garbage can. You can sometimes find water beads in toy or craft stores (try the floral section), but I find that Amazon is a great place to find them in bulk. You can get bags of multicolored water beads. Or get some clear water beads to experiment with coloring and dying. They also have giant water beads to an extra level of fun!